Funk & Son, Sandakan, B.N. Borneo. Asymmetrically clear bordered. Rounded corners. A view of the nostalgic Dunlop Street named after A.R. 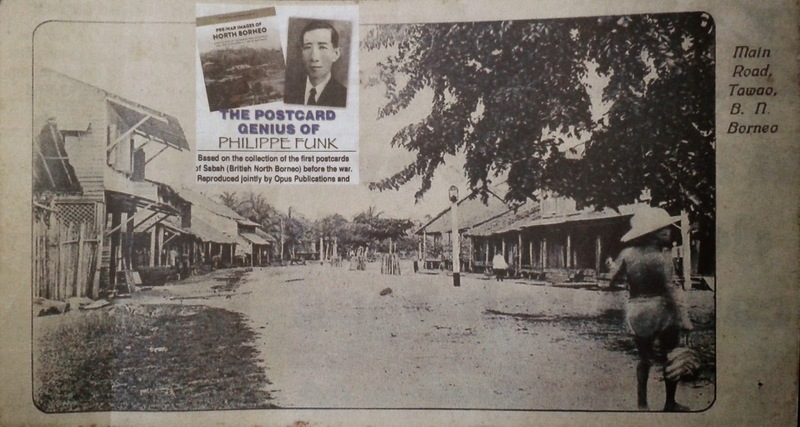 Dunlop in early Tawau. It shows wooden shophouses, and the two-storey one on the left with an overhanging zinc roof supported by brackets and those with thatched roofs built raised on stumps on the right. The former has latticed side panel for air circulation. There was a great fire in March 1953 as these timber structures were fire prone. Street light and saplings protected by wood enclosures are also seen on the right side of the street. A shirtless man wearing a pith helmet is carrying a number of fish strung through the gills, which were probably caught in the Tawau River nearby. Tawau has fertile volcanic soil which is suitable for oil palm. In the past, there were rubber, coconut, manila hemp and cocoa estates. Borneo Abaca Ltd. BAD was a well-known as hemp plantation. Before the Second World War broke-out, there was a sizeable Japanese presence, such as in the Kuhara or Nissan estates (rubber), Kubota estate (coconut) and in the Si Amil commercial tuna fisheries run by the Borneo Fishing Company. There was also a timber boom after the war at Wallace Bay and Kalabakan. The timber from Sabah was exported to Japan, Hong Kong, and Australia. Tawau is known for its valuable fish exports such as the white pomfret and the salted red snapper, (c 1910s) 103.